Dead Sea salt is a mineral-rich salt that is procured from the Dead Sea. Contrary to its name, the Dead Sea is actually a large lake which lies in the Jordan Rift Valley. Of all the world's bodies of water, the Dead Sea boasts one of the highest saline concentrations. Dead Sea salt contains over 21 minerals and high levels of magnesium. It is considered to have excellent healing properties and is effective in treating many skin problems. Additionally, this multi-purpose salt is considered to aid in general relaxation and stress reduction when used as a bath soak. It is often combined with essential oils to create soothing aromatherapy soaks as well. 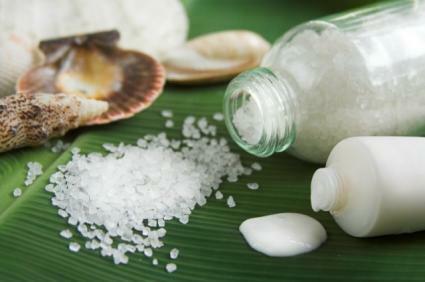 Dead Sea salt is used in a variety of ways to treat the skin and body. It is available for purchase in its raw form in fine, medium, and coarse grades. It is typically used as a foot soak or body soak in its raw form. Scents such as lavender, eucalyptus, peppermint, rose, and lemongrass are commonly added. The mud of the Dead Sea also contains high concentrations of the therapeutic salt. The mud is used in products such as facial masks, soaps, body masks and wraps, skin creams, hair masks, and facial moisturizer. For many people, making their own bath salt recipes and bath soaks is fun and beneficial. Whether you plan to use the salts yourself or give them as gifts, it's easy to make personalized recipes with salts from the Dead Sea. Food coloring is optional. You can use a few drops to enhance the color of your salts and match the fragrance. For example, use yellow with a lemon scent, pink with a rose scent, and green for peppermint. Store the salts in an airtight bottle, jar, or other container. In addition to its health benefits, Dead Sea salt is also an affordable treatment. You can purchase the salt in its raw form in bulk for several dollars per pound. Scented salts and those infused with essential oils are higher in price. Products containing these high-mineral salts vary in price. Some specialty products may cost considerably more than those found at beauty retailers, like Ulta. It is worth it to comparison shop; often, products can be purchased for less online. Dead Sea products are available at natural health stores, some department stores, select spas and salons, and online health and beauty retailers.